With the recent non-stop releases of major video game blockbusters, sometimes it’s nice to go to a mindless diversion — one that is fun to play, but doesn’t require any serious thought. 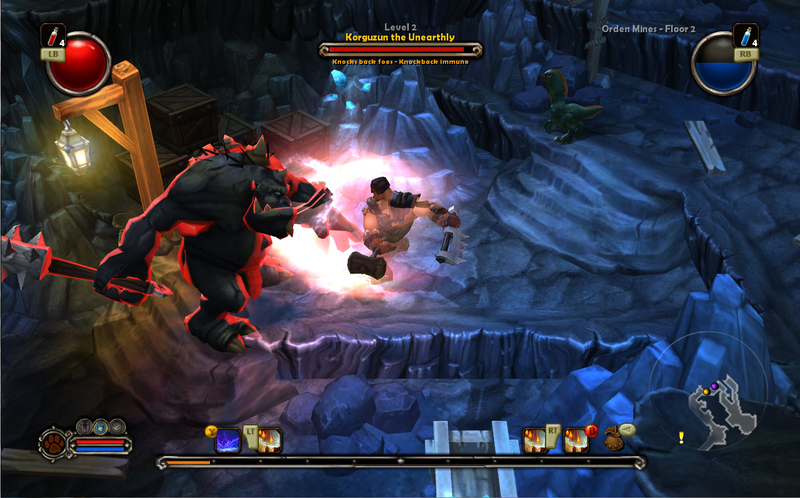 Enter Torchlight, a 2011 XBLA dungeon crawler, to fill that void. 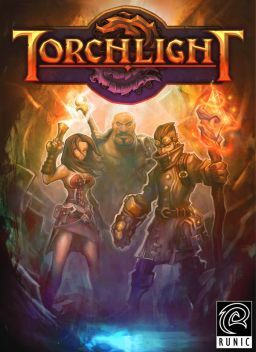 Essentially a spiritual sibling to the Diablo series (developer Runic Games is composed of ex-Diablo designers), Torchlight is a fantasy game that is all about hacking, slashing and looting. The plot is entirely irrelevant — that is to say, there is one, but it basically boils down to someone telling the main character to just keep working through a 35-floor dungeon in order to save a town from impending doom. Throw in some cheesy voice acting, and yeah, it’s ultimately rather laughable. Regardless, Torchlight delivers the goods in terms of gameplay. After creating a main character (male or female), selecting their class (Destroyer, Alchemist or Vanquisher), and determining an animal companion (wolf, lynx or “Chakawary”), you are sent to a small village and given free reign to pick up new quests. The main adventure sends you into a huge dungeon where you must work your way through floor-by-floor, battling countless enemies and the occasional bosses. The floor themes change at regular intervals, offering some new visuals to break up the monotony. Completing the main quest takes roughly ten hours, but additional sidequests and random exploration can easily stretch the game into a much higher number. How much you will get out of Torchlight depends on how much you like looting dungeons and leveling up your character. The XP system is well-developed, as you can boost attributes in a number of areas, as well as learn new skills to help in combat. The battle system is particularly brilliant, as each button of the controller can be used for a different, monster-bashing spell. It’s all fluid and easy to learn. Torchlight is great at what it sets out to accomplish, but it could be even better with a few adjustments. My biggest complaint is a lack of multiplayer. This dungeon crawler has the perfect setting for a co-op mode, but it is nowhere to be found. The upcoming Torchlight II rectifies this, but it should have been included in the original anyway. Also, the game has a bad habit of using small text in the menus. I have a good-sized TV but still had to squint to be able to read some of the items in the menu. Finally, some showdowns with multiple enemies on screen can lead to occasional slowdown. Nothing too terrible, but it can be a tad bothersome. Still, if you’re in the market for a fun Diablo-esque adventure, Torchlight comes highly recommended. Ignore the weak story and just dig into the addictive hack ‘n slash gameplay. Keep an eye out for any future deals because the game does go on sale on XBLA from time to time (I bought mine half off for $7.50), but this isn’t a bad deal at full price either. I have always wanted to play this game. Nothing but positive talk around it helps as well. It’s definitely worth checking out. I get the feeling that Torchlight II is going to blow it away, though, simply because of the new co-op mode. Can’t wait to give that a shot. As someone with bad vision, even with glasses, my least favorite part about this gen has been the insanely small text present in 75% of games now. Even with a big HD TV, I have to lean forward and squint to see text in games like this and many others. I just don’t get it. Seriously, take all my money with crappy day 1 DLC, come out with buggy games and use me essentially as a beta tester when I buy your games the first day they come out, just start upping the damn font size in games! Damn you Torchlight, DAMN YOU. Yeah, small text is becoming a pretty big problem with video games these days. I feel bad for those who are forced to play on smaller screens where it’s even harder to read in-game menus, dialogue, etc. It would be nice to see games have the option to increase font sizes — it’s not like it would be hard for them to do. Sounds like a good ‘ol game. I agree that the blockbuster games starts to get too big now-a-days, so it can be nice to just unwind with down to earth action. I should check this one out, as I am particularly fond of xp, looting and leveling up hehe 🙂 Good review! Totally agree with you; this game is great but it’s missing multiplayer. I found it very, VERY strange when the game came out that no multiplayer was supported, given how successful that feature was for Diablo 2 (and the staff that made this game). Still though, Torchlight is a very fun game. You mentioned the different attacks being mapped to buttons which is cool (I didn’t know about that because I played on the PC). I’m looking forward to Torchlight 2 a lot, though, cannot wait. Yeah, the control system worked out really well. Pretty much a seamless transition from PC, and it added a few exclusives (i.e. the Chakawary, new armor, weapons, etc.). Can’t wait for Torchlight 2 either! Eric, I tried the demo for this but never ended up grabbing the full game. The lack of multiplayer really sort of turned me off. Maybe if I can catch it on sale again I will grab it. 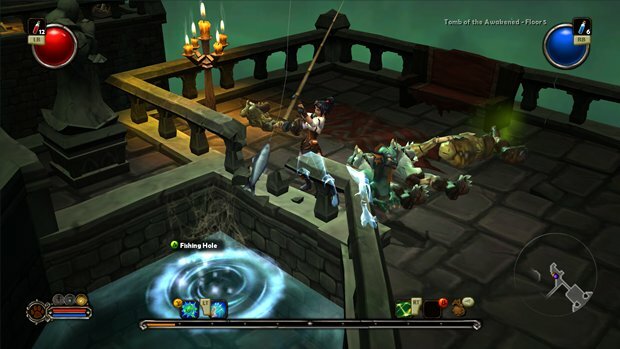 Nice review, any idea when that Torchlight 2 is supposed to come out on XBLA? That’s a fair complaint, man, and I totally understand. I would still recommend keeping an eye out for a future sale, though. As for Torchlight 2, I don’t think there is an official release date yet but it is expected to piggyback off of Diablo III’s release. My guess would be sometime in May or June. I picked this up a while ago during one of Steam’s holiday sales and loved it! It’s a very solid game. Indeed. So glad this went on sale — otherwise I probably would have forgot all about it.